It’s hard to believe, but Thursday starts August! Being Girl Scouts, who are always prepared, prepare yourself for the upcoming month with… Girl Scouting in August. August 4th celebrate National Sisters' Day by sending out cards to your closest friends and Girl Scout sisters. Consider having your Cadettes, Seniors or Ambassadors form friendships with younger Girl Scouts by having them teach the art of friendship bracelet making. In the end, the girls can trade their friendship bracelets as a way to show their bonds! Additionally, encourage your girls to make new friends this year, which will earn them their “Make New Friends” fun patch. Remember, just as Vi, the Daisy flower friend teaches us, be a sister to every Girl Scout. Talk to your Cadettes about exploring the world of financial literacy and math skills involved in the home décor and fashion industries at our program Designer Division, Stylish Subtraction, and Fashionable Fractions. From August 5-9, your Cadettes will be on their way to learning multiple methods and useful skills to aid them in their earning of their Financial Literacy badges. For more information contact Lucy Effron or register on our Programs Spotlight page. August 10 is National S’mores Day! This year while you’re sitting at a bonfire with your girls, teach them how to make this classic camping treat first created by the Girl Scouts! This gooey snack is a great and delicious reason for your troop to get together over the summer season… don’t forget to sing your campfire songs. --if you don't happen to have a campfire on August 10, check out GSNC's S'mores board on the GSNC's Pinterest page for other recipes for this yummy treat. August 25 consider taking your girls out for a fun day at Citi Field to watch the New York Mets take on the Detroit Tigers! Go with fellow sisters, troop members, family and friends and receive 20% off of tickets! Upon participation, your girls will receive a New York Mets Scout Patch! For more information contact Nicole Annese of the Mets Group Sales Department at 718-559-3020, and tell her you're a Girl Scout! 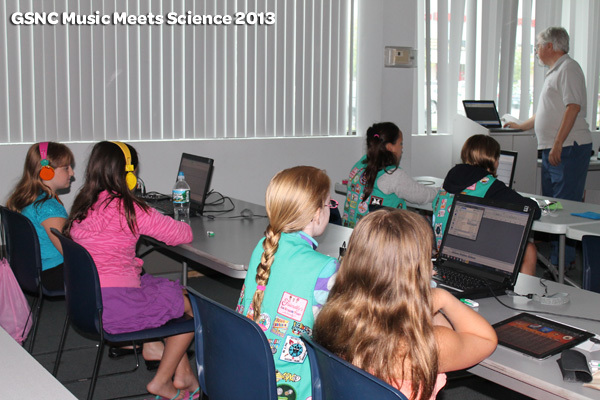 This week, Girl Scout Juniors have been exploring fun ways to interact with music and sound. 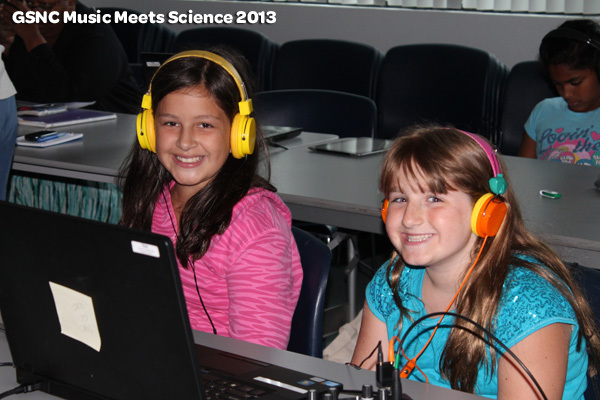 Using wireless tablets and laptops, girls have been creating, recording, manipulating and synthesizing sounds, to create their own songs, remix and sound collages. Today is the last day of the program and tonight the girls will be presenting their music creations to their friends and families. Thank girls for making the GSNC Service Center so musical and Good Luck tonight! "What you do for your family and your community, you do for the world, because the world is, after all, made up of families and communities like yours." This summer, Girl Scouts of Nassau County is challenging you to perform community service with GSNC’s Summer Service Challenge. But, what types of community service are out there for you to do? Try some of these popular community service ideas that other troops in Nassau County have enjoyed. Beach Clean Up- Just picture it, your Girl Scout Troop is at the beach flying kites, when all of a sudden, someone steps on a half eaten sandwich… how much fun is that? Nassau County is surrounded by beaches... why not keep them clean from trash so we can enjoy them for many more years to come? Habitat for Humanity- Older Girl Scouts from West Hempstead and Franklin Square helped with grouting and painting at a Habitat for Humanity home, while younger Girl Scouts made snacks for the Habitat for Humanity Volunteers. Book/Clothing/Food Collections- Many towns in Nassau County have food pantries which are always looking to fill their shelves with non-perishable foods. Collect non-perishable foods and bring them to your local food pantry. Visit http://www.foodpantries.org/st/new_york for a listing of food pantries in New York. Do you have a passion for reading or fashion? You could try collecting books or clothing. There are endless possibilities in collections. In fact, Astoria Federal Savings is collecting new school supplies for children in need with their Annual Kids Tools for School Supply Drive. Adopt-a-Grandparent- Spend time at a local senior center playing games, talking with people or singing songs and providing entertainment. Play games with the elderly and listen to the years of wisdom and stories they have to share. You may hear stories from times and events which are now in our history books. Summer Fun Day Camp Campers add 45 Smiles to Summer of a Million Smiles Count! 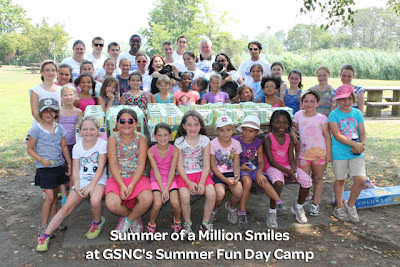 It was definitely a day of smiles for the girls who attend GSNC Summer Fun Day Camp’s Sports Spree Games week. Today, 1-800-flowers’ Summer of a Million Smiles program and Paws Unite People joined together to visit the girls at the Summer Fun Day Camp at Wantagh. Paws Unite People taught the girls the basics of dog and cat care, like one of the most important parts of pet ownership is showing your pet love. The grinning girls were then able to pet and play with the dogs that came to visit the campers…. This was definitely where the Summer of a Million Smiles team saw the most smiles. At the end of the program, 1-800-flowers team members gave each of the girls Pup-cake in Bloom™ arrangement. Since 2009 GSNC Troops have been digging down, into the dirt as part of the Girl Scout Gardeners Program by at The Farm at Oyster Bay. Both girls and adults learn how food goes from seed to table. They plant seeds, weed, do pest control, and harvest the organic vegetables grown. Once harvested, all the produce gets donated to local food pantries. Last year, the farm donated over 1,200 lbs! 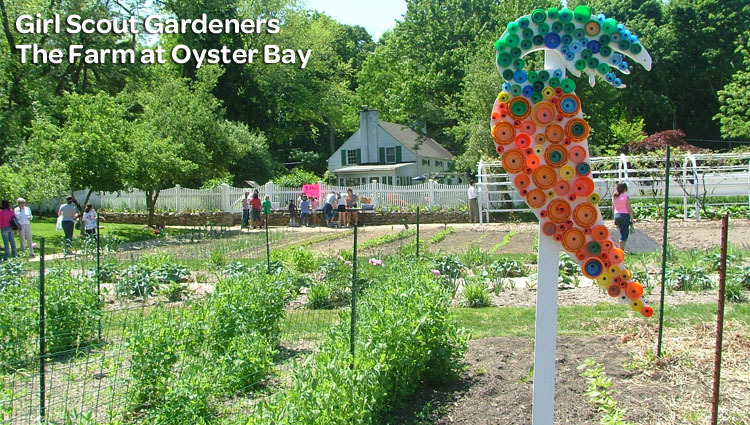 Here is a little salute of what is happening currently with the GS Gardeners at the Farm at Oyster Bay. Just wanted to share what I did at The Farm last week. Well first of all, I had an awesome time! The best part was when we were weeding; we had a competition, juniors (me) vs. daisies. The competition was whoever pulled the most weeds and made the largest 'weed pile' won. My 2 friends and I (the juniors) won. We also planted corn and pumpkin seeds. Afterwards, we went inside, drew pictures and wrote about what we did. We all got ice pops. Then sadly, we had to go home. I can't wait to go again! Building Build-a-Bear's for St. Mary’s Healthcare System By Keely B. On Friday, July 12, Girl Scouts from GSNC’s Media Girl Unit attended Build-a-Bear Workshop’s Grand Reopening at Roosevelt Field Mall. While there, Girl Scouts built stuffed bears that would be donated to children at St. Mary’s Healthcare System for Children. 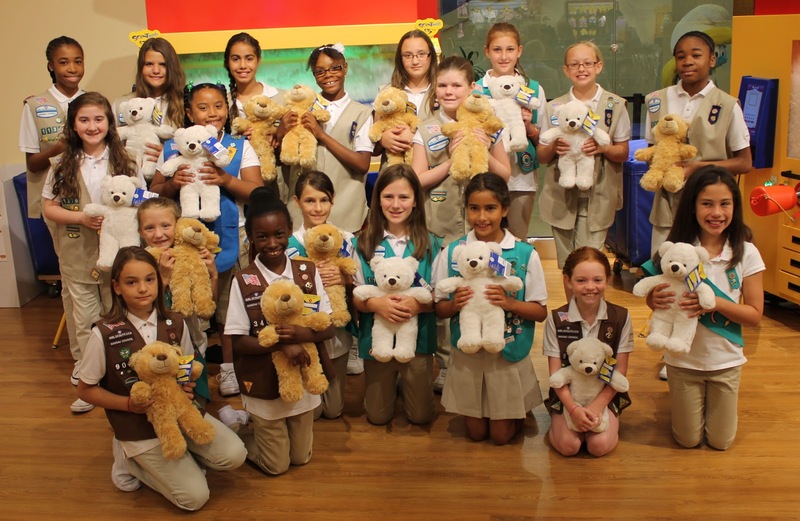 Hear Junior Girl Scout Keely’s experience with building a bear for St. Mary’s. Today, I went to Build-a-Bear workshop with my Girl Scout friends for their Grand Reopening. I made a bear for St. Mary’s Healthcare System for Children. I hope that my bear makes them smile! This was my first time ever going to Build-a-Bear…I LOVED it. We got to chose a bear and add a heart to the bear. We made sure the bear was smart, strong and fast and was just like us! We then stuffed the bear at the stuffing machine. After the bear was stuffed, we washed the bear in the bath tub and then we dried it with the blow dryer. When we were all done, we hugged the bear and put it in the bin to donate to the kids at St. Mary’s. I had a lot of fun because I was able to build a bear. I was happy that the bear I made would be given to another kid. After making the bear for St. Mary's, I was able to make a Tae Kwon Do dog for myself, his name is WOOF. Girl Scouting appeals to all ages!